The stems are hairy, hard, quadrangle- shaped, and fibrous. The leaves are about 4 cm long and 1.5 -3.5 mm wide. The flowers are alternately arranged in the spike, much smaller than those of S. hermonthica but more prominent. The colors vary from red, pink, orange, yellow, white, or purple. The stems are delicate and profusely branched. The plants never grow more than 50 cm tall. The leaves are linear, opposite, spreading, or ascending and usually very narrow, 1-3.5 cm long and up to 5 mm wide. The flowers are very similar with those of S. hermonthica. As compared to the other species, the plant is often pale-green with many closely packed stems at the ground level. The flowers are usually purple but are sometimes white or yellow. The stems are hairy, hard, quadrangle-shaped, and fibrous. The leaves are narrow and gradually decreasing towards the tip. The size is 2.5-7.5 cm long and up to 2 cm wide. The flowers are found in a dense spike. Each spike may contain 6-10 open flowers. The colors vary from bright pink, rose-red, and white. The symptoms on corn are difficult to distinguish from those caused by lack of water (drought), like wilting and curling of leaves at an early stage. The infected plant may also show stunting and a pronounced burning of the leaf borders. The leaves are 'burnt' when the parasitic weed dominates over the corn plant. Striga weeds are difficult to control once they are established on corn plants. Because they get their nutrients from corn, they contribute to the latter's very low production in most countries in Africa. Use seeds that are Striga seeds-free. Avoid using seeds from the previous harvest if the crops were infested with Striga. Buy the seeds for your next cropping from an agricultural seed store in your locality. Intercropping corn with silver leaf desmodium (Desmodium uncinatum) or green leaf desmodium (D. intortum). Desmodium is a leguminous plant that is a good source of fodder for the farm animals. When planted as an intercrop, it covers the surface in between the rows of the main crop (corn, sorghum, or millet). 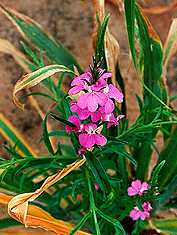 Desmodium emits chemical into the soil that is unfavorable for Striga's growth. 2.5 kg of seeds are needed for 1 ha. Hoeing and hand weeding before Striga plants start to flower. Late weeding requires the burning of collected plants to kill the seeds. Never put them in your compost pile or pit. Apply organic fertilizer and other organic soil supplement to improve the crop's stand. Berner, D; Winslow, M; Awad, A; Cardwell, K; Mohan Raj, D; Kim, S. (1997): Striga research methods - A manual. 2nd Edition. International Institute for Tropical Agriculture, Ibadan, Nigeria.